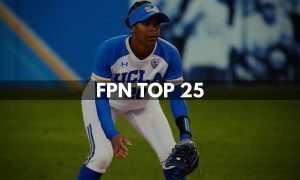 We are already more than half way through the 2018 College softball season and teams are well into conference play. This upcoming weekend will be filled with conference rivalry games, Top 25 match ups, and all of the teams are fighting for the top spots in their conference. Below are five teams to watch for this upcoming weekend. The Huskies will wrap up a two-week home stand this weekend against the California Golden Bears. Washington is on a nine-game winning streak in Pac-12 play, its longest since 1996, and now stands alone in first place in the conference. The Huskies have swept three straight Pac-12 opponents, taking down No. 10 Arizona, Stanford, and Utah. One more win would give Washington its third Pac-12 win-streak of ten or more games in program history. The Husky pitching staff has been lights out over the past three series. 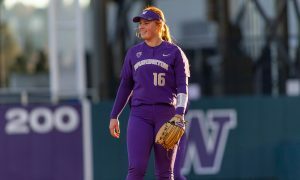 Freshman Gabbie Plain tossed just the seventh perfect game in UW history last weekend against Utah. The staff as a whole only allowed five base runners in all three games. Taran Alvelo earned her 20th win of the season last weekend, moving her record to 20-1. The junior holds a 0.72 ERA and has struck out 193 batters in 135.1 innings pitched. The Golden Bears are 1-8 in the Pac-12 this year but have lost three conference games in extra innings already. 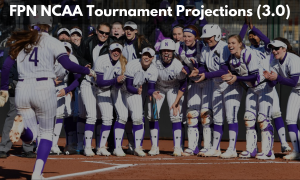 Washington swept Cal last year and have won the season series nine times in Heather Tarr’s 13 years. Since 2000, Washington holds a slight series lead at 28-26. The Huskies are one win away from the 40-win mark on the season. The Seminoles enter the weekend series at Boston College after coming off a 4-1 victory over No. 7 Florida on Wednesday night. Kylee Hanson tossed a two-hitter and posted five strikeouts in the complete game victory to improve to 20-3 on the year. 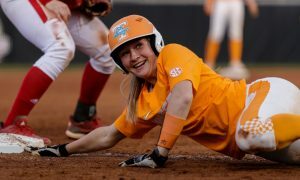 It marked the eighth consecutive start where she allowed two or fewer hits, and her 14th of the season in 23 appearances. It is the first time that Florida State has won consecutive games against the Gators since 2006. 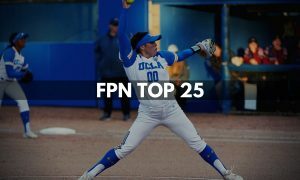 The Seminoles have won four straight games over ranked teams in 2018 and are 8-3 on the season against teams in the NFCA Top 25. The Seminoles have won 22 of its last 23 games overall and recently ended a 36-game winning streak in ACC regular season play which is the fifth-longest conference winning streak in NCAA history. Florida State leads the all-time series against Boston College, 35-2, and has won the last 28 games in the matchup, The Noles are an undefeated 10-0 against the Eagles on the road. Texas State is another team entering the weekend, after coming off a big midweek win. The Bobcats defeated Texas 2-1 on Wednesday night in front of a record breaking crowd at Bobcat Softball Stadium. The win gave Texas State its 30th of the season. Randi Rupp has been lights out for the Bobcats in the circle. 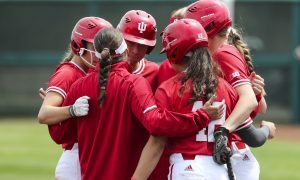 The senior tossed all seven innings in the victory over Texas, which gave her win No. 100 of her career. Rupp now sits in second in program history for wins behind Nicole Neuerburg, who holds the school record with 107. Rupp holds a 1.27 ERA with 232 strike outs in 170.1 innings pitched. Texas State is set to take on Louisiana in a three game conference series this weekend. The Ragin Cajuns hold a 26-10 overall record on the season and are 12-3 in conference play. The Wildcats are riding a five-game win streak as they head into their weekend SEC series against No. 8 Texas A&M. In its last five games, Kentucky has earned wins over rival Louisville, Eastern Kentucky and Middle Tennessee State. Four of the five games were run-rule wins, and now puts Kentucky just one more win away from clinching NCAA Tournament eligibility with its 26th win to guarantee a .500 record or above. 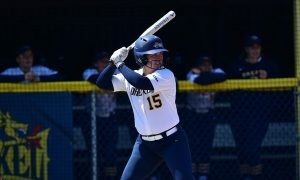 Leading the way for the Wildcat offense is Katie Reed who holds a .426 batting average and 49 hits on the season. 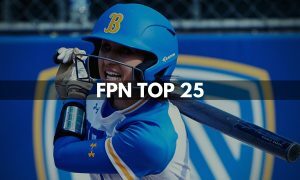 Bailey Vick is close behind with a .425 average and 45 hits. Texas A&M enters the weekend series with a 34-9 overall record in 2018. The Aggies are led by Jo Evans, who is in her 22nd year in charge down in College Station. The Aggies who are 7-5 in conference play, have been riding the arms of Trinity Harrington (11-1, 1.38 ERA) and Samantha Show (10-3, 2.12 ERA) this season. The Wildcats are 5-4 all-time against the Aggies, and took a three-game series, a year ago in Lexington on Senior Weekend at John Cropp Stadium. 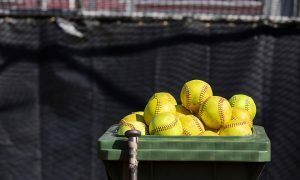 The Oklahoma State softball team, coming off a midweek win at Missouri State, heads into a pivotal weekend of Big 12 action, as the Cowgirls welcome No. 20 Baylor to Stillwater for a three-game set. 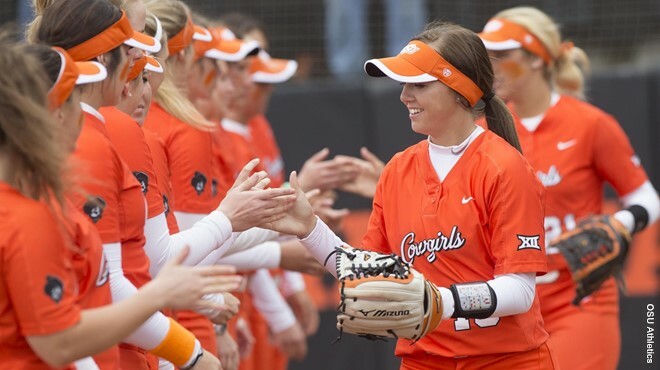 OSU and Baylor split the season series last year, 2-2, with the Cowgirls winning the final two meetings between the teams, including a 2-1 victory to secure as spot in the Big 12 Championship game. Vanessa Shippy, who owns OSU’s career on-base percentage record (.502), has recorded 66 hits over her last 55 games played. 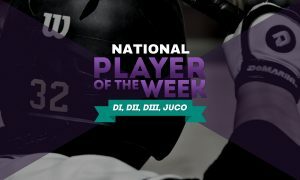 The senior, who has started 214 consecutive games in her career is leading the Cowgirl offense with a .477 batting average and a .688 slugging percentage. 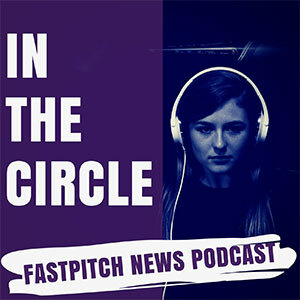 The Cowgirl pitching staff holds a 2.23 ERA on the season and has been pitching by committee. Baylor is coming off a tough mid-week loss to McNeese which snapped its five game win streak. Gia Rodoni has pitched the majority of the innings this season for Baylor. The junior is 14-7 and holds a 2.36 ERA in 124.1 innings pitched. The three game weekend series is set to kick off on Friday.